I wouldn’t normally drive a hundred miles to have lunch with strangers, but that’s what I did yesterday. Becky George, a California-based fan of my Childless by Marriage book who is also a writer, invited me via Facebook to meet her in Corvallis, Oregon. She was coming up from Santa Clara to meet her new hypoallergenic cat. Her what? Yes, hypoallergenic cat. It seems breeders have found a way to produce cats whose saliva has lower levels of the enzymes that give many of us hives, breathing problems, runny noses or itchy eyes. Charlotte is a Siberian cat, with the colors of a Siamese but with long fluffy fur. 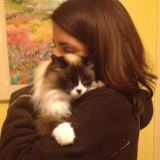 She’s sweet, funny, tiny under the fur and did not make me want to rip my eyes out and scratch them with a Brillo pad. Since Charlotte is such a special breed, Becky had to come up to Oregon to find out if they would get along. They do. It seems Siberians are big business these days, with several breeders in Oregon, including Daisley Siberians and Forest Star Siberians. These gorgeous cats are expensive (many in the $700-900 range), and adoptions are done with great care. I didn’t know what I was getting into when I arranged to meet Becky in Corvallis. Through a series of Facebook messages, we agreed on lunch. Then she said her mother was making lunch for us. I envisioned melting into a family gathering at Becky’s mother’s house and probably eventually watching the Super Bowl together. Well, not exactly. My Mapquest directions led me to the top of a hill where the road dead-ended at a Christmas tree farm. A man there told me this was not the place, even though the address was right. He pointed back down the hill and said maybe they were there. At that point I was kicking myself because I did not know Becky’s mother’s name, nor did I have a phone number or email address outside of Facebook—and I don’t have a “Smart Phone.” I tried the next house over. Thank God that was it. It turns out Becky, her mom and two of Becky’s friends were renting this guest house at Donovan Place. I was introduced to her mother Maria, just flown in from Florida, and her friends Tania and Mackenzie. The young women all work together at a company in Silicon Valley and had come up for an extended slumber party at this quaint cottage full of antiques and artwork. They introduced me to Charlotte, the kitten who inspired the trip. Charlotte went from lap to lap, jumped onto counters and windowsills, and chased a toy bird on a string and a “Robofish” in a plastic bowl, keeping us all entertained. While Maria prepared us a fabulous Cuban lunch, a chicken stew over rice, I chatted with the girls, played with the cat and tried not to feel old. Here on the coast, retirees dominate the population. Most of my friends are my age or older. So it’s unusual for me to talk to young women in their 20s and 30s and a mother who is probably younger than me. Unusual and delightful. We know lots of the same companies and places because they live and work where I used to live and work. It was fun comparing notes and listening to them discover things like the Santa Cruz boardwalk that I have known about all my life. Talking to these smart attractive women made me feel good about the future of our world. They were just starting to learn about Oregon. Someone had taught them the term “sun break.” When Maria asked if we had had any sun breaks all day, we all shouted “No!” When Maria showed me the view of the pine trees out their back window, I thought, big deal, trees, but to her, it was something to marvel at. The girls were amazed when I walked over to the old Singer Sewing machine cabinet, opened the lid and pulled up the antique sewing machine–which was just like the one I first learned to sew on. They had never seen one that wasn’t plasticized and computerized. It was a wonderful afternoon of sharing and laughing. As for the Super Bowl, was there a football game yesterday? Kidding. I turned the TV on the second I got home to catch the second half. As William Butler Yeats’ famous saying goes, “There are no strangers here; only friends you haven’t met yet.” Thank you, ladies. And Becky, may your “fur baby” Charlotte bring you many years of happiness.